For the love of design & for the love of packaging. As children, the smell of roasted papad wafting through the house, indicated that lunch was ready. We would promptly abandon our books and toys for that piping hot papad off the flame. Waiting for my grandmother to carefully place that hot papad in my thali was akin to torture. Irrespective of what our meals contained, it was papad that had my attention. Our household had specific pairings and days for particular types of papad – spicy moong papad with khichdi on a rainy day, sabudana papad with coriander chutney during holi and papad moongodi ki sabzi on grocery shopping day. What started as a papad tale has grown and become more of an epic. As one of the most overlooked items in our dining eco-system, papad is still an essential component of every Indian meal and has been for generations. The objective of this project was to bring papad the glory it deserves. 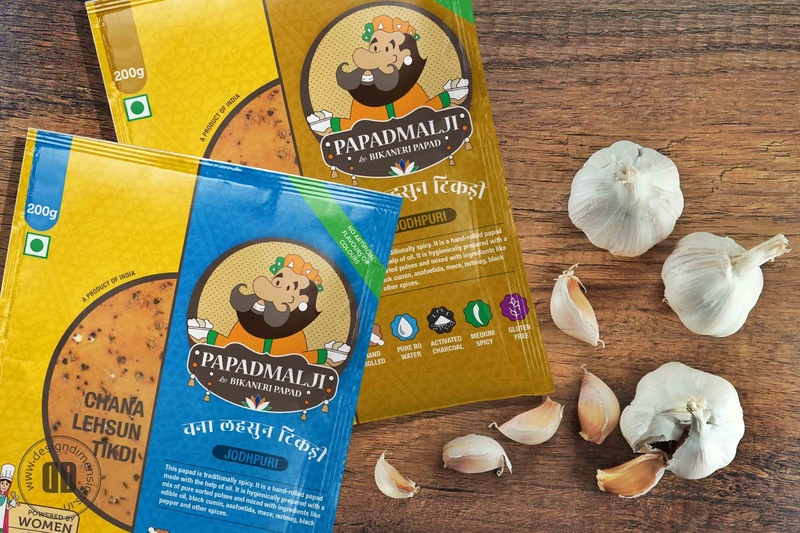 We wanted the immersive experience of papad to come across in the packaging. Every household in India has at least one meal accompanied with papad. The first step was product planning. As Vishal Papad our client already had an extensive range of products, however the new company – Papadmalji needed a well curated list of products that would be sold through modern retail. We divided the products into three categories – Bikaneri, Jodhpuri and Modern. Our packaging needed to be bold and vibrant to be able to stand out gloriously on the shelves. The three ranges are differentiated through patterns, colours and processes. 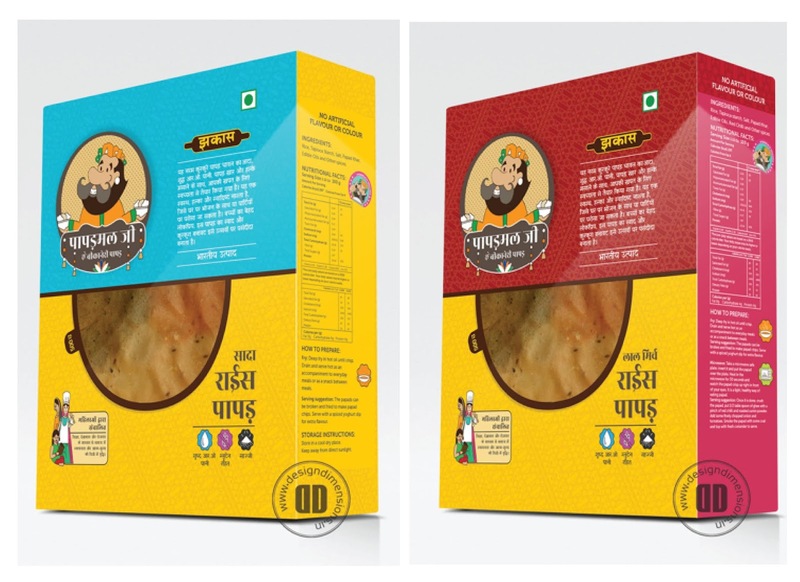 The youthful and vibrant vibe created during the initial stages of the branding remains with the addition of patterns and characteristics for each type of papad. Love makes the world go round and the love with which Papadmalji’s papad is made; definitely makes our world go round. We’ve modified the mascot to create a new logo for Papadmalji’s brand new company. Localisation is integral to brands that sell or intend to sell on a pan-India scale, thus the logo has been used bilingually – in English and Hindi across all kinds of packaging. To go one step further, we localised the logo for different parts of the country to make the brand more approachable and accessible – we’ve done versions in Bengali, Gujarati, Malayalam, Punjabi and Urdu. When we went to the factory and saw the client’s enthusiasm for creating high quality products our outlook towards papad changed forever. This entire packaging exercise has been to reinstate papad as the one-true-king of every Indian household. This is our effort to restore papad to its former glory of being the most sought-after morsel in every meal. We want the people to sit-up and acknowledge papad for what it is – the spicy bits with khichdi, the crispy and crunchy bits with daal-chawal, the in-between-meals snack, the impromptu get-together face saver and the all-time favourite drink accompaniment. The Jodhpuri Range is Papadmalji’s version of gluten-free, hand-rolled papad, made with oil. A special pattern was created for the packaging, which has been used on every packet. We have chosen a vibrant colour palette to echo the palate of this range. From mild to very spicy – the Jodhpuri range of papad has something for everyone. A tiled pattern of rolling pins adorns each packet in the Jodhpuri series to indicate that the papad is a labour of love that has been hand-rolled for you. Papadmalji’s Bikaneri range is hand-rolled papad, made with atta (whole wheat). 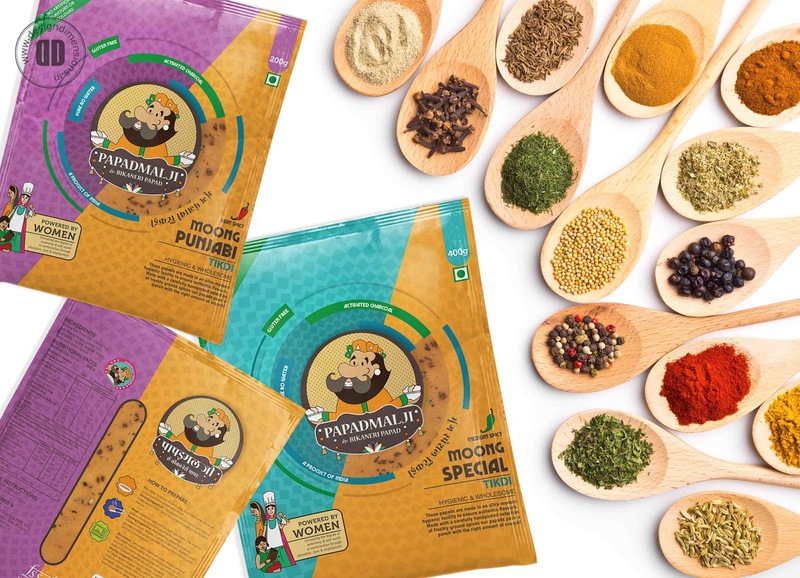 This range is extensive with a wide variety of papads made with various core ingredients – Moong, Urad and Rice. 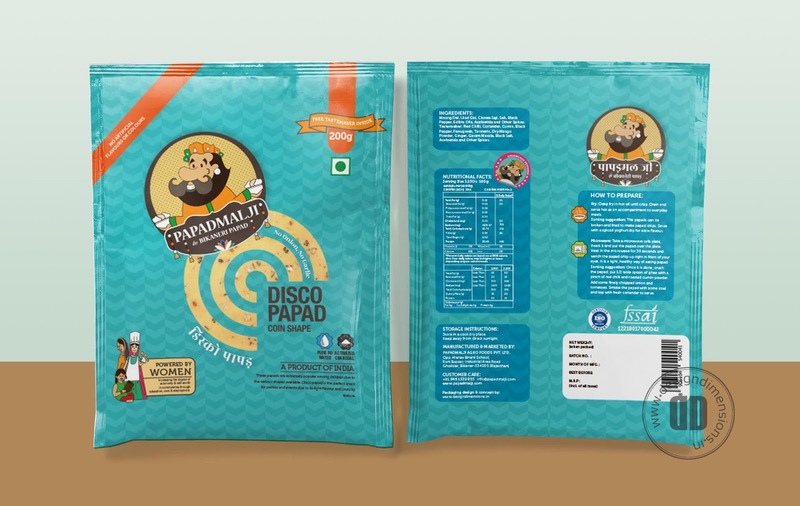 Disco papad is a new addition under the Bikaneri range, which comes in 5 different shapes and is available in various packing sizes. Disco papad is the perfect snack at any time of day, due to its light flavour and crunchy texture. Zhakaas rice papad is hygienically prepared with rice flour, pure RO water, activated charcoal and light spices. This is a healthy, light and tasty papad that can be served with meals at home or as a snack between meals. The papad is small in size and prone to crushing easily, hence the box packaging to minimise breakage. The light flavour and crunchy texture of the papad makes it a hit with adults and children alike. 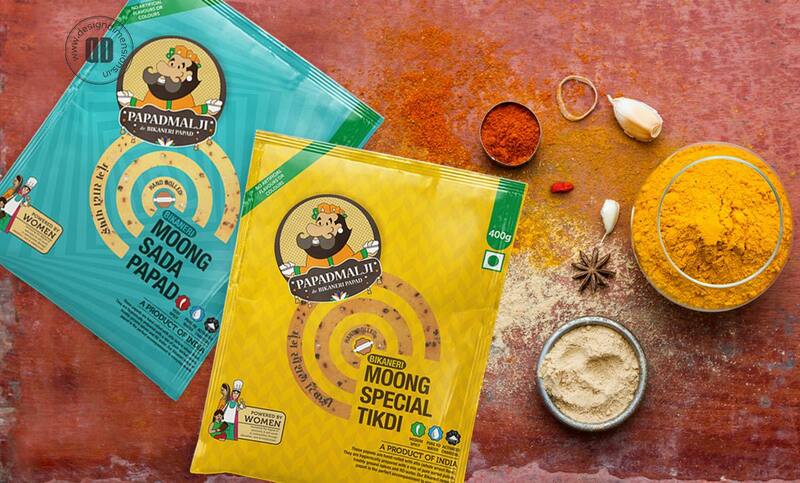 The Modern range is an exclusive variety of papad made in an ultra-hygienic facility to ensure authentic flavours. Made with carefully handpicked, freshly ground spices these papads pack a punch with the right amount of crunch! All the papads under this category are gluten-free. Khichiya is one of the most popular fried snacks from Rajasthan. It is produced hygienically and then sun-dried to perfection. Traditionally eaten as a side dish or snack along with the main meal. Often eaten with tempered raita or with crisp green chilly – it trumps chips anyday! We kept one important aspect in mind when it came to designing this packaging – the company’s core values – hygiene and cleanliness should be etched into their brand story and should be visible throughout their product range. Hygiene is a very important part of any manufacturing process, especially if it happens to be in the food and beverage industry. This hygiene sticker is proof that all the products are manufactured in a clean and safe environment to further our clients’ commitment to quality assurance. Having visited the factory in Bikaner we can proudly say that the papads made by Papadmalji are Hygienically prepared – just like the sticker says! 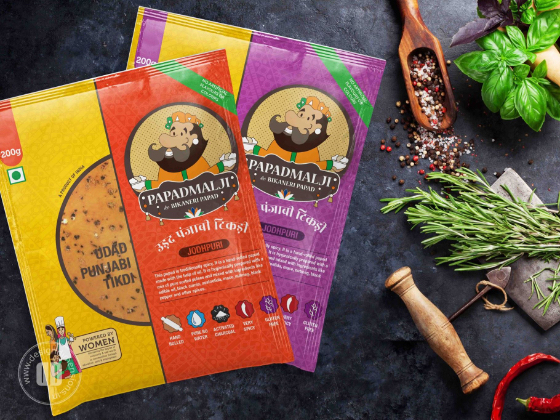 The three new categories of Papad, each with their numerous flavours and variety had one thing in common – they harmoniously combine taste with health and we wanted to bring this to the forefront. To highlight the brand USPs in each range we created an icon set that would clearly indicate either a process or an ingredient. 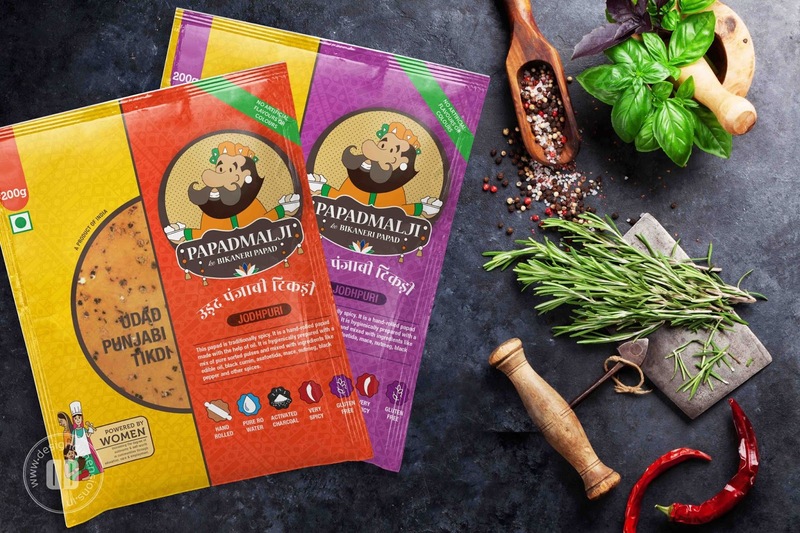 There are icons for hand-rolled papad, sun-dried papad, gluten free papad, activated charcoal (Sajji) as a core ingredient, pure R.O water and spice levels. Incidentally, activated charcoal – the latest buzzword in today’s health industry has been around for ages. It is intrinsic to papad making and is locally known as ‘Sajji’ or ‘Khar’. The addition of activated charcoal gives papad its digestive quality and contributes to the crispness of fried papad. It also helps increase the shelf-life of papad. 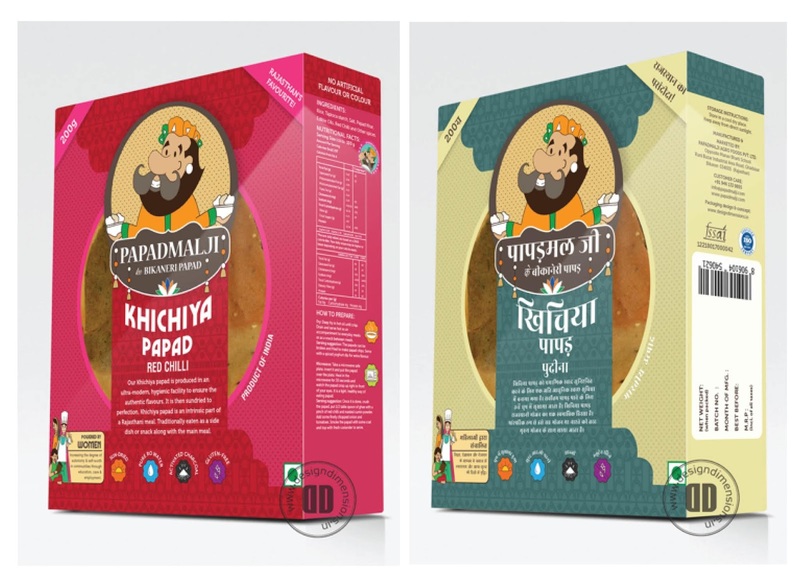 The reverse side of the packaging has icons depicting the various methods in which the consumer can prepare the Papad – fried, roasted or microwaved; along with a serving suggestion for each style of preparation. We were very moved and inspired when our client told us that he is where he is because of the women in his organisation. That these women are so dedicated to their work and while people may think the company provides them’ with purposeful employment and a means to earn a living, it is actually the other way around. The company exists because these very women, are at it’s core. 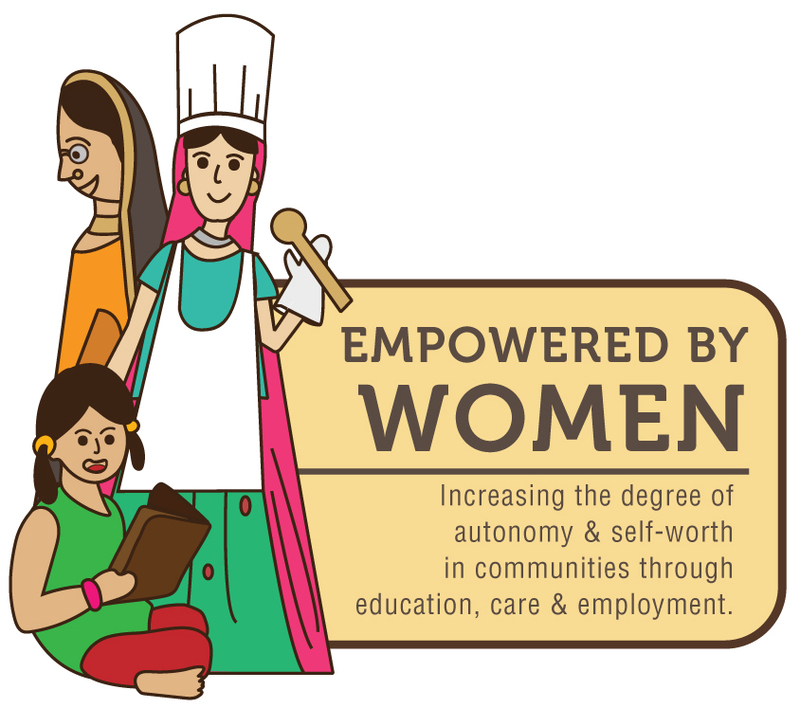 This is why each packet has the ‘Empowered by Women’ symbol to honour the women working behind-the-scenes as the reason for the brand’s success. 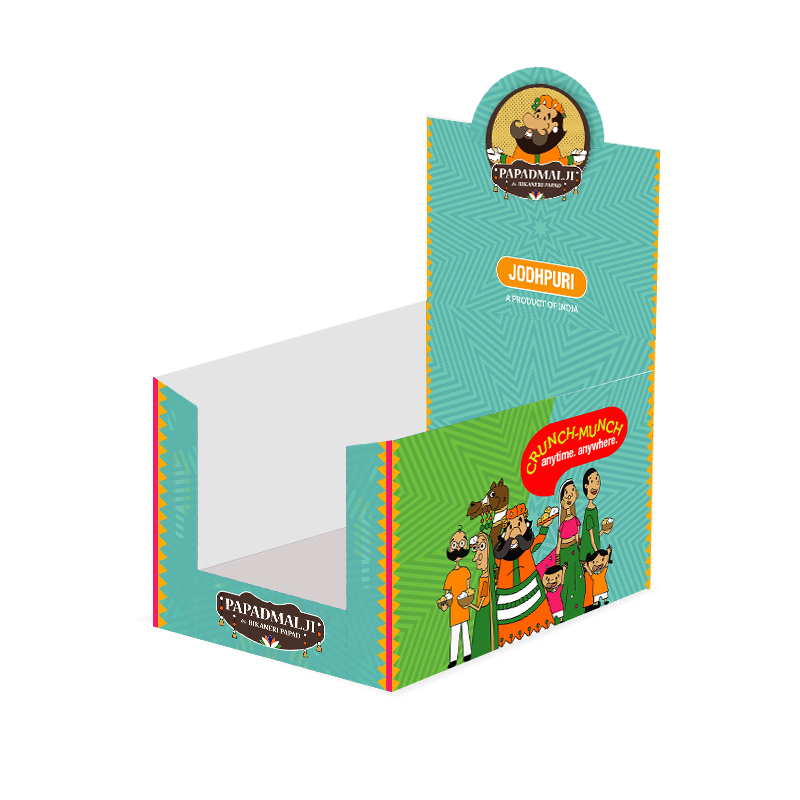 The display boxes are bright and vibrant while the outer cartons have a single colour print on brown paper. 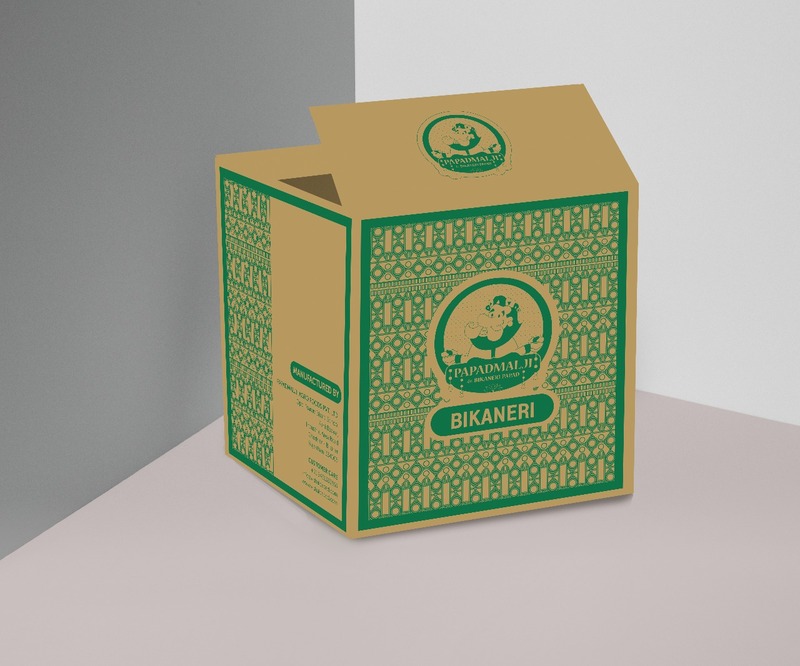 For us it is important to consider packaging waste while designing products and we have applied that across the board during the product planning stage. 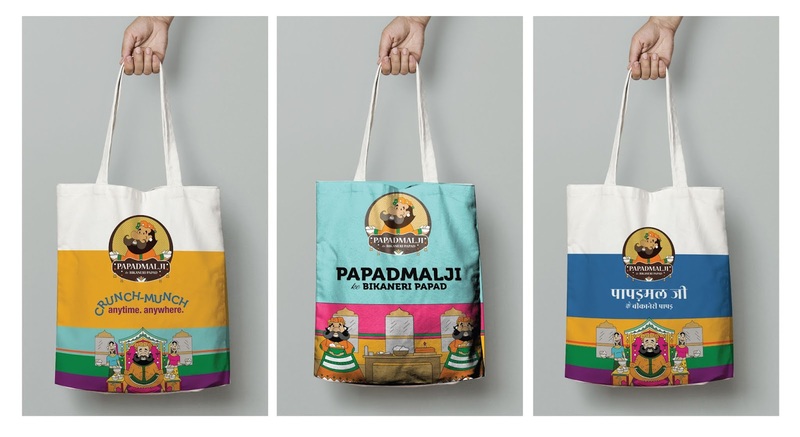 These were intended for gifting, seeding and sales purposes and follow the vibrant family theme of the initial characters and designs we created around Papadmalji. Designed to be printed on canvas and cotton these colourful, reusable bags could brighten anyone’s day. A new product needs introducing and the stalls are designed for that very purpose. 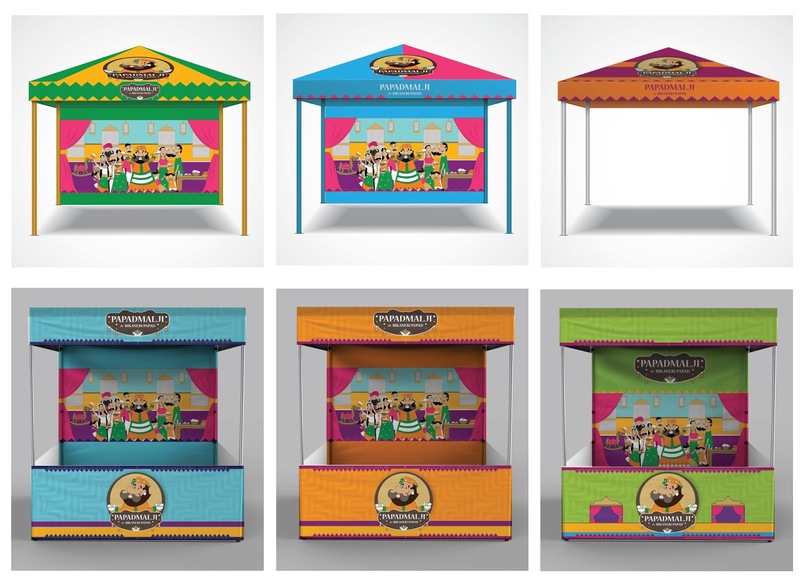 From in-store carts to canopy designs and make-shift gazebo tents, there is a whole lot of Papadmalji coming your way this year! We feel very privileged to have worked on this project because of the passion with which our client makes his products – that passion permeated our entire office and strengthened our love for the kind of work we do. We’re eagerly awaiting the launch of these products and hope we have managed to reignite the passion for papad in at least, some of you.